Pirates Bay Adventure Golf01621 854095work Pitch & Putt/Crazy GolfBrand new 19 hole pirate-themed adventure golf course. Fantastic fun for all the family as you navigate your way around the beautifully themed course. There are talking pirates, cannons, water explosions and a huge pirate ship. PLUS, look out for the shark!! We are floodlit and open 9am until late every day throughout the season. 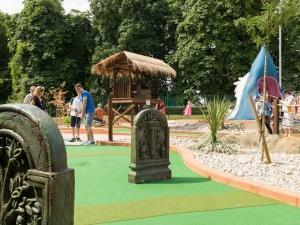 Brand new 19 hole pirate-themed adventure golf course. Fantastic fun for all the family as you navigate your way around the beautifully themed course. There are talking pirates, cannons, water explosions and a huge pirate ship. PLUS, look out for the shark!! If you are celebrating a birthday, corporate event or any other type of function, why not take advantage of our party room. For more details contact 01621 854095 or e-mail info@piratesbaymaldon.co.uk. It's guaranteed to be a great day out!